With a sound described as Roy Orbison, Neko Case, and Leonard Cohen combined, Kathy Greenholdt's songs explore the fragile nature of living. To date, this album has been added to over 140 radio stations across the U.S.
Chicago singer/songwriter Kathy Greenholdt pens earthy, elegant music that explores the fragile nature of living. Her songs are a pop/rock/Americana mix — a sound described as Roy Orbison, Neko Case, and Leonard Cohen combined. 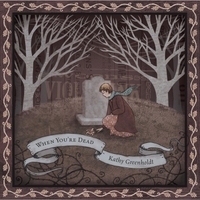 "When You’re Dead," her fifth album, was produced by Steve Dawson. To date, it has been added to over 140 radio stations across the U.S. There are just two musicians on the songs: Kathy on vocals (and guitar on the final track) and Steve on guitar, bass, drums, organ, piano, and more on the other tracks. All songs were written by Kathy, except for the title track, When You're Dead (Tom Recht) and The Beast in Me (Nick Lowe).